Senior Citizens (60 & up) or Veterans receive two for one Ukelele or guitar lessons. Find a friend and learn / practice together. Hello and Welcome to the studio of Ian Tremor. I have been teaching at Island Music for over 8 years. Prior to teaching, I was a professional musician on the road playing all over the U.S. and Canada for 7 years. My two main instruments that I teach are guitar and ukulele. If your child shows an interest in music and is too small for the guitar, you may consider starting them on the uke. Small hands, small instrument to start and later moving them to the guitar. I really enjoy teaching. Over the years I have had many happy and successful student musicians in my studio. I have received many letters from parents expressing thanks for teaching their student. Music will help you or your child in many areas of life and it takes great discipline to master an instrument. 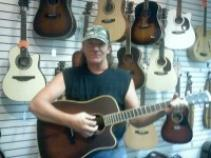 Please stop in at Island Music or call me so that we may talk further or check for available lesson times.